A recent ruling in the High Court of Justice, Queens Bench Division of the Technology and Construction Court, is likely to have significant implications for the waterproofing industry. Thomas Weatherald Ltd. was the main contractor responsible for the design and construction of a new nursing home at Bramley Hill in Croydon. The structure included the construction of a basement built into the well-drained chalk on the site. The floor was constructed in reinforced concrete. The walls were constructed out of two skins of concrete block, sandwiching a layer of concrete in between. The structure was waterproofed externally using Bitite, a bonded sheet membrane. A land drain was positioned approximately one third of the way up the wall, and discharged to a soak-away a little distance from the building. The construction of the basement structure, waterproofing and land drain was subcontracted to Outwing Construction. Shortly after completion, leaks occurred internally after a period of prolonged and heavy rainfall. Thomas Weatherald withheld money from Outwing Construction, on the basis that they had incurred additional expense in applying Sika render internally. Outwing sued Thomas Weatherald for the balance of money owing, and Thomas Weatherald counterclaimed for the cost of the Sika installation together with other damages. 1. Clause 3.3 of BS 8102, Code of Practice for the Protection of Structures Against Water from the Ground, states that the designer should i) Consider the consequence of less than adequate workmanship, ii) Consider the consequence of leaks and iii) Consider the form and feasibility of remedial work. 2. By installing the land drain in the position shown, the designers created a head of water that would bear against the membrane. In these circumstances, any defect would constitute less than adequate workmanship, as the consequence of those defects would be flooding through the membrane into the basement. 3. It is not realistic or reasonable to expect a bonded sheet membrane to be applied without any defects at all. 4. 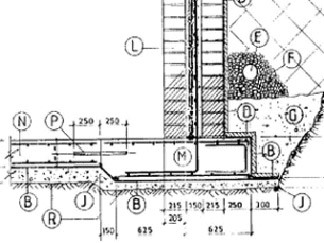 Clause 3.1.1 of BS 8102, Pre-Design Considerations, recommends that basements should include provision for resisting a pressure equivalent of 1m head of water at least. 1. Having read their reports and heard their oral evidence, I unhesitatingly prefer Mr. Hewitt's evidence and reject Mr. Mawditt's views that a self-adhesive tanking system of waterproofing such as that which was installed could be expected to resist water penetration in the event of a build up of hydrostatic pressure. 2. I agree with Mr. Hewitt that overlapping self-adhesive membranes cannot be expected to achieve a total or absolute watertight bond capable of resisting penetration by water pressure. If this were thought to be something realistically achievable, then the guidance given, in relation to the use of tanked protection systems where high or perched water tables exist (permanently or from time to time), in publications such as BS 8102 and the Basement Waterproofing Design Guide (see in particular, the discussion under the heading "Guide to Assessing Basement Designs" beginning on page 17 of the document -page 84 of the trial bundle) would be unnecessary. Furthermore, if this were thought to be something realistically achievable, then it is difficult to understand why those responsible for the Standard and/or the Design Guide should so clearly and consistently contemplate the provision of perimeter land drainage below the lowest level of the tanking system. 3. In my judgement, as Mr. Hewitt said, the waterproofing system consisted of both the tanking membrane and the sub-soil drainage. 4. For all the reasons put forward by Mr. Hewitt (with which I agree) this design did carry with it such a risk after periods of heavy rainfall when a perched water table or perched water tables might come into existence, and the factual evidence was that the water penetration problem only became apparent after heavy rain. 1. Ensuring that, where there is any risk of water pressure building up against a membrane, (whether it is permanent or temporary) the water is removed before it comes into contact with the membrane. 2. This could be done by incorporating drainage membranes leading down to land drains at the base of and running around the perimeter of the structure, from where the water is either drained or pumped away. 3. If the above is not practical, then an alternative form of Waterproofing/Construction must be selected.